Poor Calvin's in Atlanta, Georgia, is where Asian and Southern cuisine meet. Owner/Chef Calvin Phan has created a fusion menu that incorporates the flavors of his native Vietnam with the rich, savory taste of Southern cuisine. The product is a menu that is interestingly eclectic, innovative, and daring while still offering options that are pleasing to a wide assortment of palettes. Poor Calvin’s also offers scrumptious desserts that are made on-site. Locals and visitors looking to enjoy the unique flavors of Asian and Southern fusion cuisine need look no further than Poor Calvin’s. Reservations for Poor Calvin’s are not required, but they are recommended. Reservations can be made online via Yelp Seat Me or by calling the restaurant directly at 404-254-4051. · Brunch - Small Bites: crab cakes, fried goat cheese, seafood spring rolls, coconut shrimp, chicken and pork dumplings, lobster mac n’ cheese, and more; entree: seafood omelet, chicken and sweet potato waffles, pineapple shrimp fried rice, fried fish and grits, crispy beef; drinks: Bloody Marys, Screwdrivers, Tiki rum punch, mimosas, and more. · Lunch - Small bites: beignet basket, basil rolls, devilled eggs, lobster wontons and more; entrees: crabmeat grilled cheese, fish curry, pad thai shrimp, udon noodle shrimp, and more. 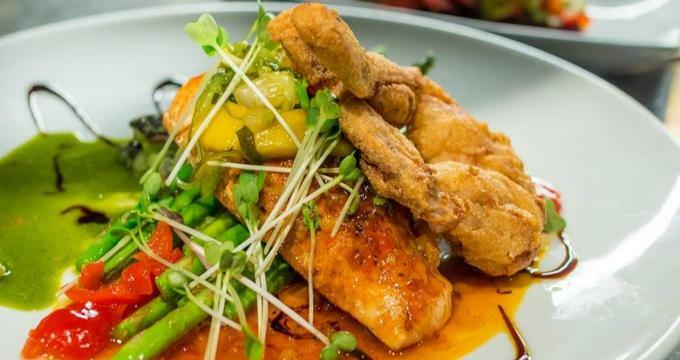 · Dinner - Small bites: lemongrass steamed mussels, fried calamari, fried frog legs, watermelon salad; soups and salads; seafood: pad thai tiger shrimp, grouper Thai curry, seafood mélange and more; land: fried chicken, duck dynasty, lamb chops, steak, and more. · Wine/Cocktails/Beer - Wines: white, red, and sparkling wines served by glass or bottle; draft beers and signature and classic cocktails. Customers can enjoy the Asian Southern fusion cuisine on the go or from the comfort of their own homes by ordering online. Poor Calvin's partners with Zifty to offer delivery of its menu items. Customers can view a complete to-go menu on the Poor Calvin’s website. Poor Calvin's offers private dining and catering services. Individuals interested in using Poor Calvin's as a venue for private parties or special occasions or as a catering provider for an off-site event can complete an online form of interest on the Poor Calvin’s website or contact the restaurant directly at 404-254-4051. Gift someone the unique culinary experience that is fusion Asian and Southern cuisine via a Poor Calvin’s gift card. Gift cards can be purchased by contacting the restaurant directly.